As well as being a picture book author, I'm a Patron of Reading. A Patron of Reading is a children's author, poet, storyteller or illustrator who partners with a school to encourage and develop a culture of reading for pleasure within that school. I thought I’d use this post to tell you about The Picture Book World Cup, a week-long reading for pleasure project I helped organise at my Patron of Reading school, Asfordby Captain’s Close Primary School in Leicestershire. The inspiration for the project came from Texas elementary school teacher Dianne Fulton. 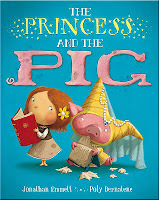 Back in March, Dianne sent me the tweet below to tell me that The Princess and the Pig, one of my picture books with illustrator Poly Bernatene, was in competition with 15 other books in her school's Sweet Sixteen Book Challenge. The challenge was a knockout contest, where books were played off in pairings with students voting to decide the winner of each pairing. Dianne kept me posted on The Princess and the Pig's progress via Twitter and I was delighted to see it get all the way to the final before its winning streak was finally interrupted by David Ezra Stein’s Interrupting Chicken. It seemed like such a great idea that I decided to adapt it to use with my patron school. Dianne's wall chart reminded me of the progress charts that newspapers and magazines give out at the beginning of a football World Cup. 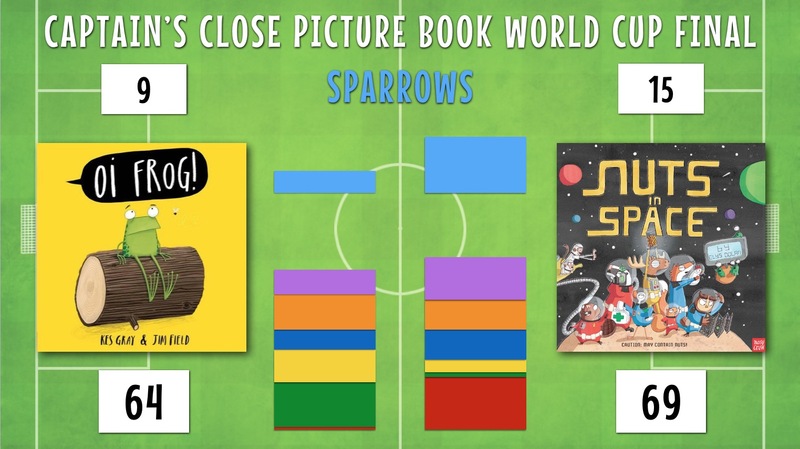 So we called our version the Captain's Close Picture Book World Cup and I created this World Cup style progress chart to go with it. Each class had a copy of this chart to follow the contest's progress. I firmly believe that picture books can be enjoyed by all ages – not just preschoolers and infants – and Captain's Close's Literacy Co-ordinator Lisa Gackowska and Headteacher Julia Hancock feel the same way. So we had the whole school vote in our contest, from Reception right the way up to Year 6. 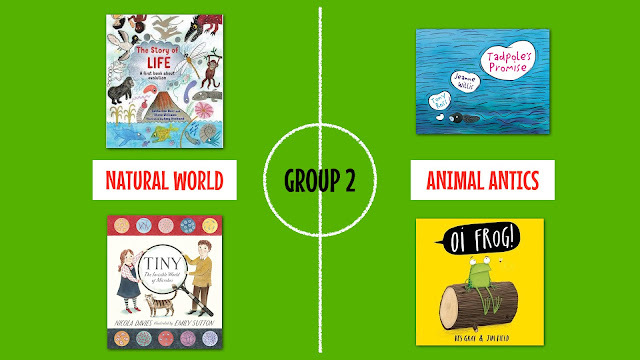 The initial groups were age-graded, so the Group 1 books, which were voted on by Reception class, were chosen to appeal to slightly younger readers than the Group 2 books which were voted on by Years 1 and 2. However, as the contest progressed, the age range voting on each match widened. So all of the Key Stage 1 students got to vote on the outcome of Semi-Final 1, while all of the Key Stage 2 Students voted on Semi-Final 2. And the whole school got to vote on the outcome of the final. One of my aims as a Patron of Reading is to introduce reluctant readers to new books that they'll enjoy reading. Many reluctant readers prefer non-fiction to fiction, so the initial selection contained an equal number of non-fiction and fiction books, with each group starting out with both a non-fiction and a fiction match. And – following the example of Dianne’s US version – each of the initial matches had a different theme. Group 2's non-fiction books were both about the Natural World and their fiction books had an Animal Antics theme. I wanted to encourage students to stray off the beaten path a little, so I tried to avoid books by big name authors like Julia Donaldson (as much as I admire her work). And – to ensure impartiality – I didn’t include any of my own picture books. I introduced all sixteen books in a special assembly at the beginning of the week. Once the voting had begun, students could follow the progress of all four groups on one of the wall charts, which were updated after each round. The School's World Cup corridor display with a wall chart showing the progress of the contest. After fourteen qualifying matches, the two books that made it all the way to the final were Oi Frog! 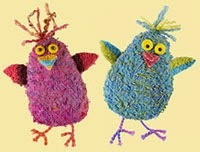 by Kes Gray and Jim Field and Nuts in Space by Elys Dolan. You can see the results of each qualifying match in the filled in version of the chart below. Here's how the chart looked before the final. At the end of the week we had another special assembly to finish the contest. I started off by asking students if they had any favourite books that hadn't made it to the final and was pleased to discover that all of the books in the contest had found some new fans. 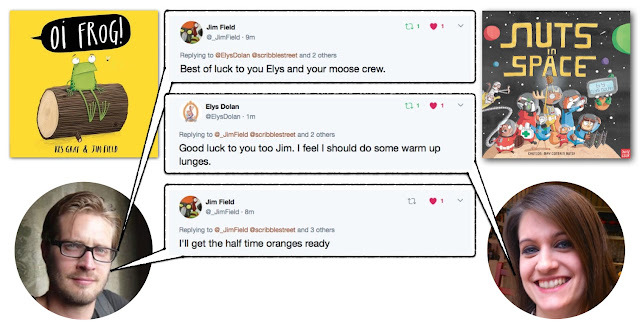 I’d been tweeting updates on the contest throughout the week and I showed the students some of the responses I’d received from the authors and illustrators of the competing books. You can read some of these tweets in a collection here. Finalists Jim Field and Elys Dolan engaged in some pre-match banter on Twitter. Then it was time to reveal the winner. The votes for the final had been collected by secret ballot and – to string out the suspense – I announced the results a class at a time. It was a close run contest, with the lead shifting from one book to the other as the votes were counted in. Both books had enthusiastic supporters who broke out into excited cheering whenever their book pulled ahead. I've never had to ask a school audience to settle down so many times! I'd ordered the results so that it wasn’t clear which book was going to win until the votes from the very last class were counted in. Sparrows Class were the last to have their votes counted in. … Nuts In Space, by Elys Dolan! Congratulations to Commander Moose and his crew for boldly going all the way to World Cup glory and to Elys Dolan for creating such a wonderful book! 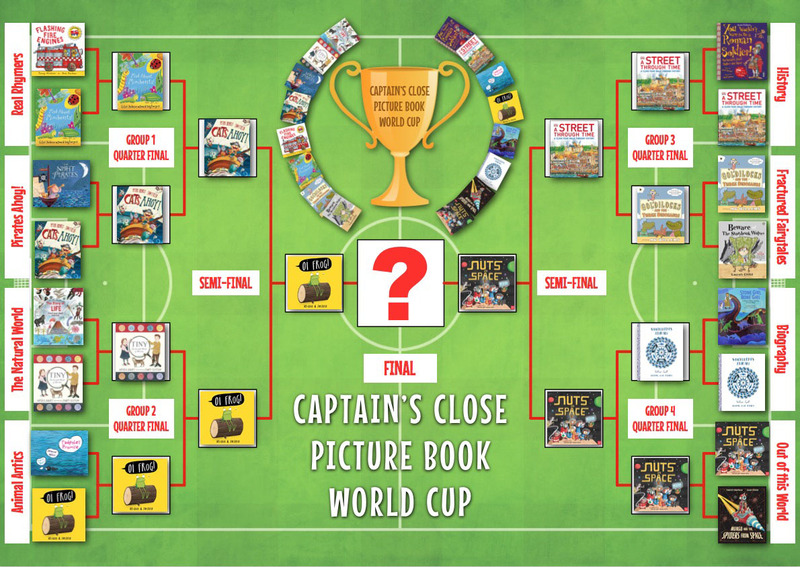 My three year tenure as Captain Close’s Patron of Reading ends this term and the Picture Book World Cup was a great way for me to sign off. 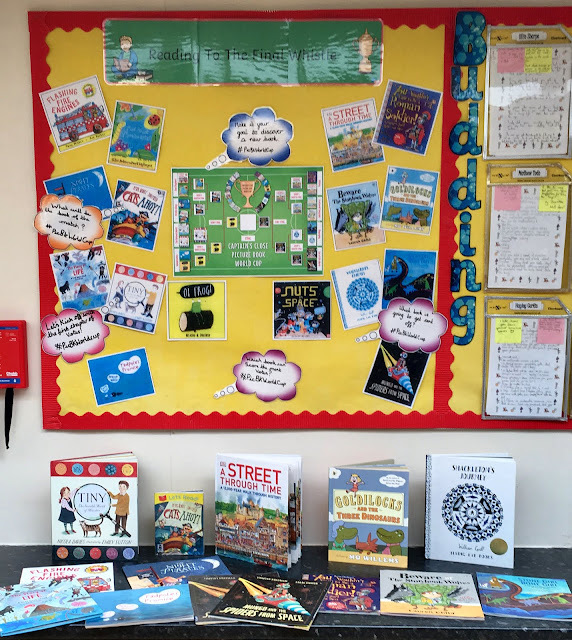 So I’d like to give a big THANK YOU to Dianne Fulton for letting me steal her idea and another big THANK YOU to Literacy Co-ordinator Lisa Gackowska for doing such a great job of refereeing the project in school. If you’d like to try running your own Picture Book World Cup I’ve created some PDF progress charts and logos that you can download. There are two sets, one that uses the same books as the Captain’s Close contest described above and a blank template set that you can fill in with your own choice of books. Click here to download a chart and logo with books. Click here to download a blank chart and logo. Here's a timetable that can be used to run the contest over a week with students split into four groups and an equal number of fiction and non-fiction books. Each group has to read six books and take part in five votes. Introduce the contest and all 16 books in morning assembly. Read the two non-fiction books in your group and vote on them. Read the two fiction books in your group and vote on them. Have a quarter final vote between Monday’s non-fiction winner and today’s fiction winner. Semi-Finals: Read the quarter final book chosen by the other group on your half of the chart and then have a vote between that and Tuesday's quarter final winner from your own group. Final: Read the semi-final book chosen by the other half of the school and then have a vote between that and Wednesday's semi-final winner from your own half of the school. Reveal the winner in assembly! 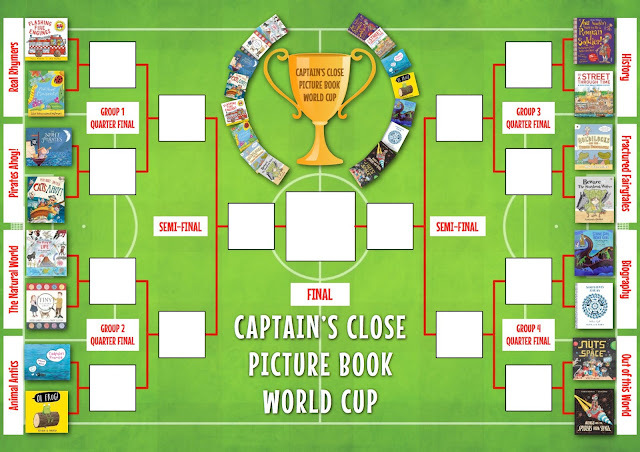 If your school runs a Picture Book World Cup and you're on Twitter, please share your results using the #PicBkWorldCup hashtag, so that other schools can see which picture books are the most successful at engaging young readers. 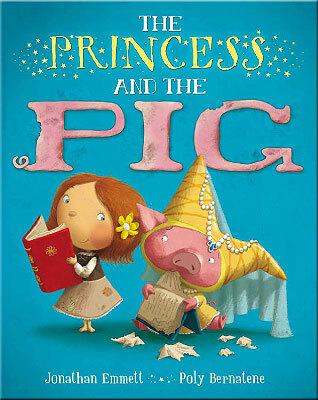 Jonathan Emmett's 'Sweet Sixteen' finalist book was The Princess and the Pig, illustrated by Poly Bernatene and published by Macmillan Children's Books. What a fantastic idea. I'll be sending this link to a few friends who work in schools, I'm sure they'll be interested. Thanks Lynne. Having had a bit of google, it seems quite a few US schools seem to have run "book tournaments" for children's fiction. See the links in the comment below. I've just come across a couple of articles about similar "Book Tournaments", for fiction rather than picture books, run by US school. Here's a great quote from the first article. "The enthusiasm for reading this project generates has been incredible over the past three years I have done the tournament with my kids. Students are exposed to and become interested in a host of different books based on the recommendations of their classmates. They rush to the library eager to try out new books, genres, and authors they might never have considered before. My most reluctant readers begin new series of books, discuss books with their friends, drag books to recess, and beg me for extra time to read in class." Thanks, Jonathan. 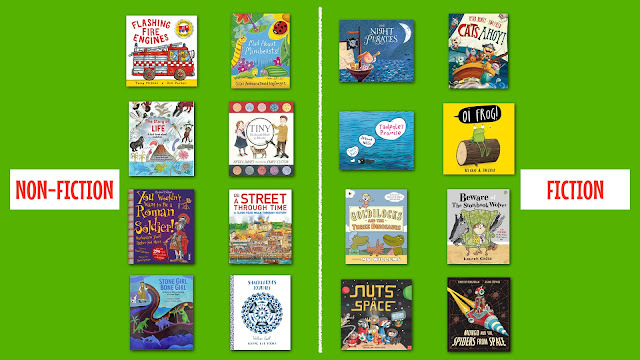 This is a really great idea to encourage Picture Book reading - and useful to have it explained so fully and with downloads too. This is brilliant and inspiring Jonathan, and made easy by your 'How to do it, step by step guide'. I can imagine the clamour in the hall as the results are read class by class. I can see this taking off all over the country. I will be mentioning this to my son's teacher first thing in the morning! Thank, Garry. There really was a clamour in the hall. It was great seeing a whole school getting so fired up about picture books! Absolutely brilliant, Jonathan! But let's hope Simon Cowell isn't reading this....there's a TV contest in it! What a wonderful idea! I find that some healthy competition often increased engagement :) I bet the children loved this!! And great to include both fiction and non-fiction books! Well done to Nuts in Space! What an excellent idea, and so impressively organised. Wow, Jonathan! Thank you so much for sharing both idea and practicalities. I hope lots of schools follow your lead. What a fun, interactive way to encourage an interest in picture books. I'm impressed! I suspect it was tricky deciding on the books.